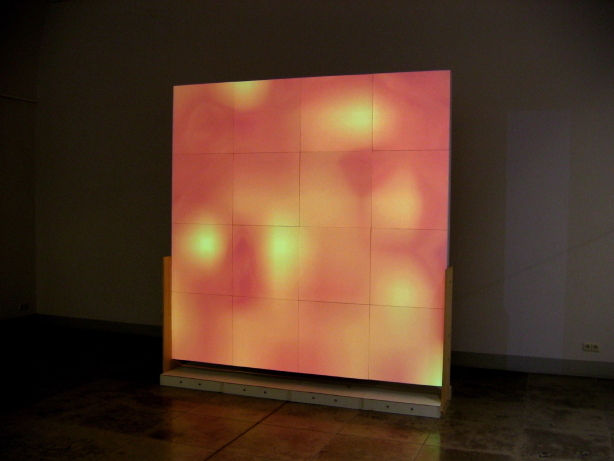 Paravent (2006) is a digital audio video window screen of the wind and its effects. The audio and video generated are conceptually based upon the idea of “coloured hearing” (synesthesia) through the representation of the accumulation of particles, like grains of sand (or pixels) blowing in the wind across a surface. Paravent is analogous to the creation of sand dunes or snow banks. It is a representation of the kinetic energy of the wind called Wind Space Architecture (WSA). Paravent interprets the 64-channel wind data created and recorded using Wind Array Cascade Machine (2003). This data is used by the Paravent system to generate video and audio. The result is a unified image and sound structure, where the exact same data used to generate the visualization is also the data used for the sonification. 2006 – RIXC Centre for New Media Culture / Latvian National Museum of Art Arsenals, WAVES – Everthing Flows, Riga, Latvia.